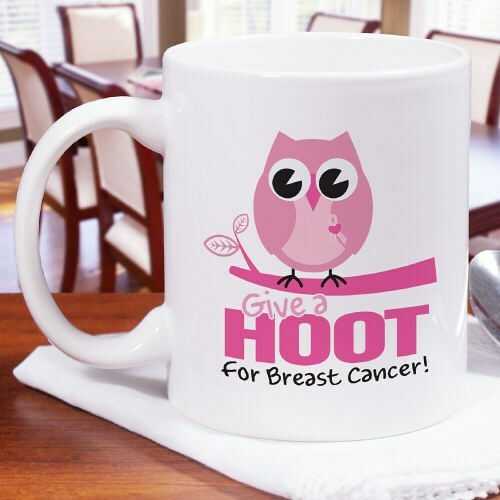 Start your day off with a wonderful reminder to spread breast cancer awareness each time you use this Breast Cancer Awareness Give a Hoot Designed Coffee Mug. Your Breast Cancer Awareness Ceramic Coffee Mug is dishwasher safe, and holds 11 oz. Additional Info MyWalkGear.com has many additional Personalized Breast Cancer Shirts and Walk Gear for your special gift giving needs. You will also enjoy this great design featured on our Give a Hoot Breast Cancer Awareness Golf Towel & our Breast Cancer Awareness Hat as well.